San Sebastian is known for rustic pintxos bars and avant-garde Michelin star restaurants– where to begin? Here’s my advice for where to eat in San Sebastian! San Sebastian is home to some of the best food in Spain! 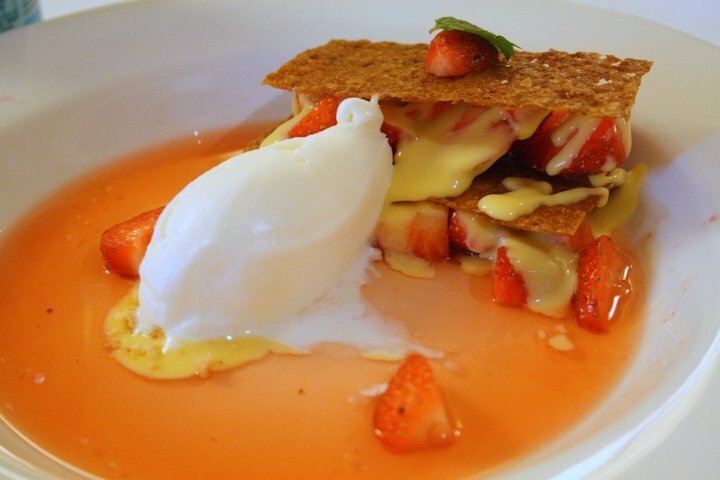 Wondering where to eat in San Sebastian? Not only will I share my favorite local spots below, I’ll also tell you the 13 must try foods in San Sebastian so you can be sure to order well in this foodie paradise! That’s welcome, in Basque. San Sebastian is the beating heart of Spain’s food scene. While each Spanish city and region can hold its own when it comes to gastronomy (in my opinion), San Sebastian takes things to the next level as the world stage for gastronomic innovation and research (the world-famous Basque Culinary Center is one of the country’s best resources). The first time I visited San Sebastian I was totally overwhelmed. No amount of reading and preparation can really prepare you for the feast that is San Sebastian. Colorful pintxos line the bars in the simplest of establishments, and Michelin Star restaurants dot the countryside. 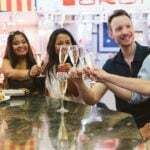 People pour out onto the streets with their food and drink, and there is a foodie buzz that’s unlike any other I’ve experienced. A modern pintxos bar in San Sebastian. 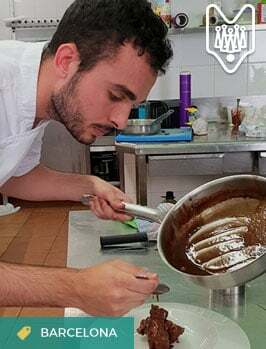 Those that follow my social media will know that we recently launched food tours and pintxos tours in San Sebastian— and this Spring Devour San Sebastian food tours has really taken off! Join us for San Sebastian’s best pintxos tour! Many people have asked me, what took so long? Honestly? The lack of the AVE (Spain’s high-speed train)! Unfortunately, Basque Country is still a little trickier to reach from Madrid– although there are frequent flights to Bilbao and a regular train (about a 5-hour journey). But 2017 was the year, so we booked a long-stay apartment in San Sebastian and made our way up to research, plan, hire, and EAT! It was a great process, and our first tours are receiving rave reviews. While researching day in and day out, I was able to greatly increase my list of where to eat in San Sebastian recommendations, the base for this San Sebastian food guide. This is certainly not the be all end all of where to eat in San Sebastian– but it’s a great start to diving into this culinary mecca, fork first! Don’t go Michelin star if you don’t have the budget. There is plenty of excellent, gourmet food in San Sebastian, and much of it is found in humble establishments. Don’t feel the need to splurge (especially if it’s your first visit) and simply appreciate the local fare. Take one pintxo at a time. 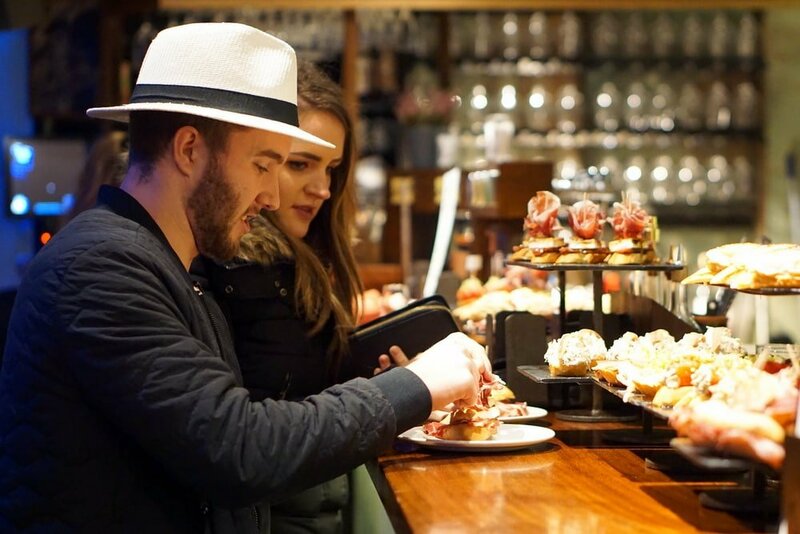 This is how you test a place for quality, and also allows you to visit multiple places in one night (see our San Sebastian pintxos tour for a guided pintxos hopping evening out!). Order the pinxtos that aren’t already on the bar. Sure – they are beautiful and tempting, but the great pintxos are almost always made to order. Ask the waiter for what’s available! Go to a cider house. Ideally in-season (from January to April), but if that’s not possible, there are a few that stay open year round (see below). It’s still a great experience! Eat a T-Bone. 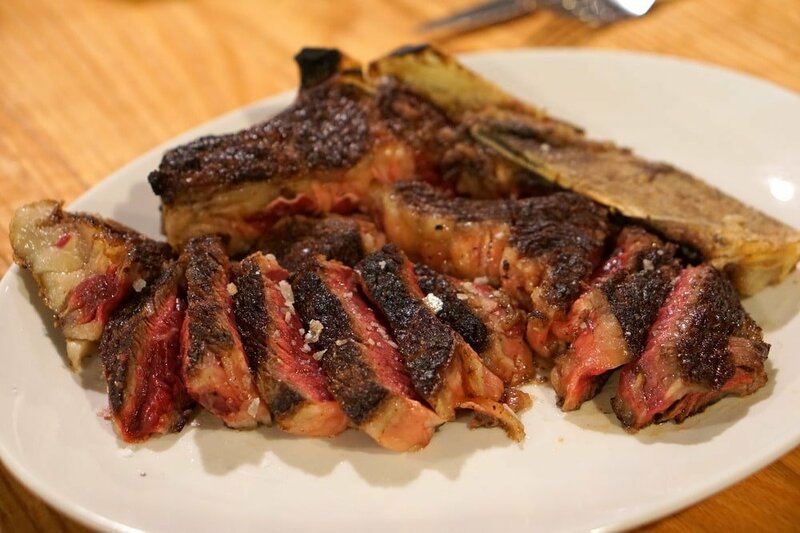 Just in case you don’t make it to a cider house where T-bone steaks (chuletones/txuletas) are the specialty, make sure to go to a great steakhouse. 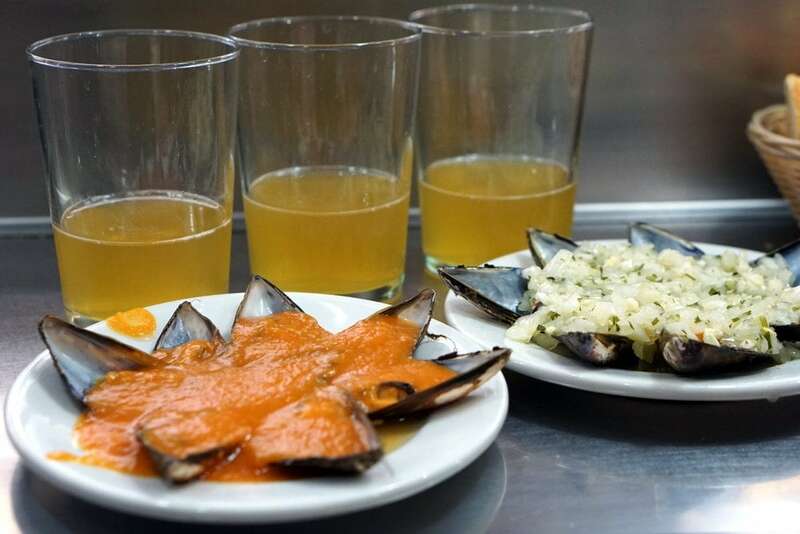 The list could be endless– the Basque Country is filled with amazing meat, seafood, and produce– but here are some must-try foods in San Sebastian! 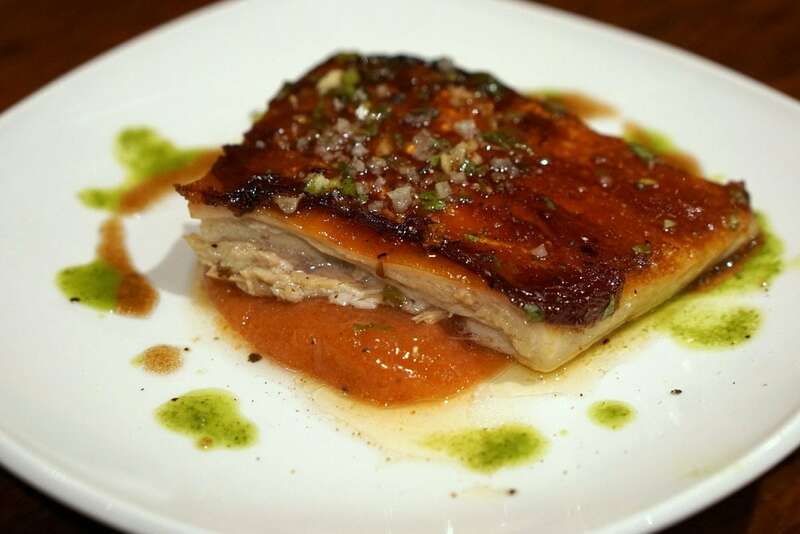 Scroll down to find out where to eat in San Sebastian (now that you’ll know what to order!). The nearby Cantabrian Sea is home to some of the world’s best anchovies, which in Basque Country are treated with the respect they deserve. The best of the catch is not prepared fresh, but rather sent to the canning factories to be preserved. The result? The best brands will cost upwards of €10 for a small tin, and they are an explosion of flavor and umami– melt-in-your-mouth, slightly salty, and totally delicious. 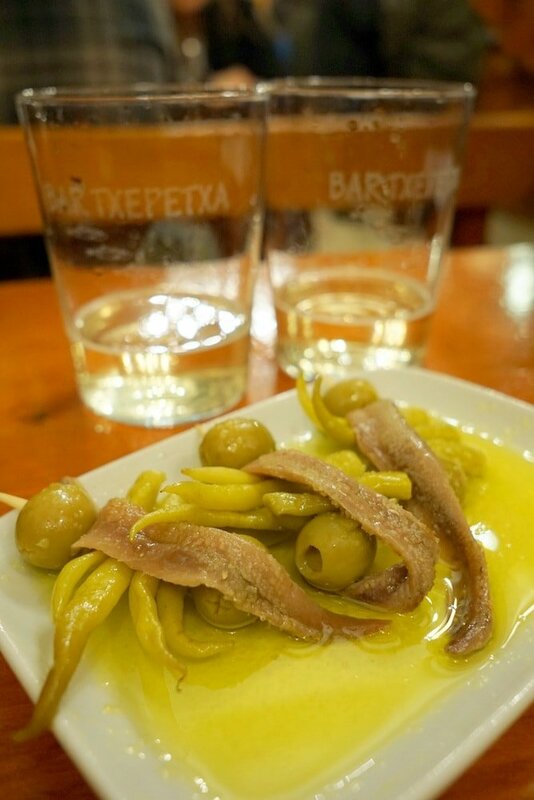 To take this already delicious bite up a notch, try the “Gilda”, a skewer made with salt-cured anchovies, olives, and pickled spicy peppers. The incredibly delicious “gilda” one of my favorite things in the world! 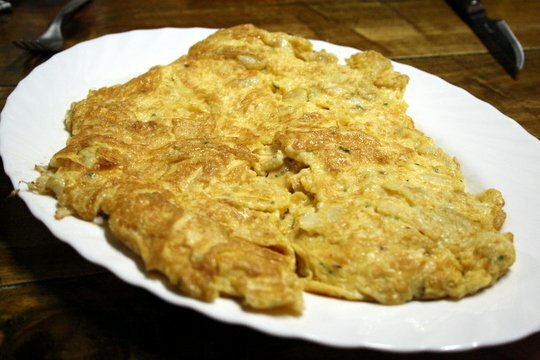 The tortilla de patatas (Spanish potato omelet) tastes best in Basque country. Other Spaniards may disagree, but in my opinion, the Basques make it best. They usually cook their flavorful tortillas to be “medium rare” meaning they’re juicy and creamy, though not runny. This is a very common pinxto that you may find on its own, or dressed up with some fried green peppers, local cheese, or even sausage. Just remember to make sure to never have your tortilla reheated (meaning it might come room temperature) as the microwave makes it chewy and overcooked. 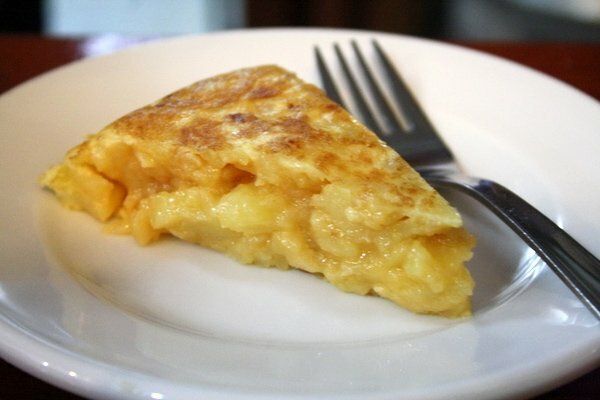 Tortilla de patatas, made perfectly in most San Sebastian bars! 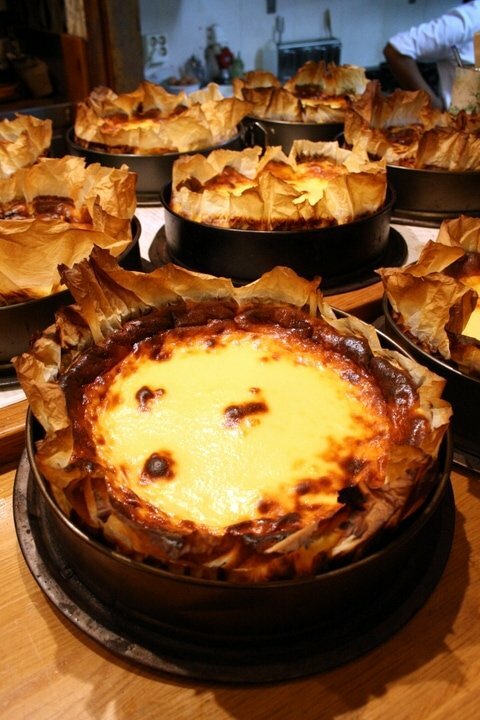 Who knew that San Sebastian would be home to my favorite cheesecake in the world? 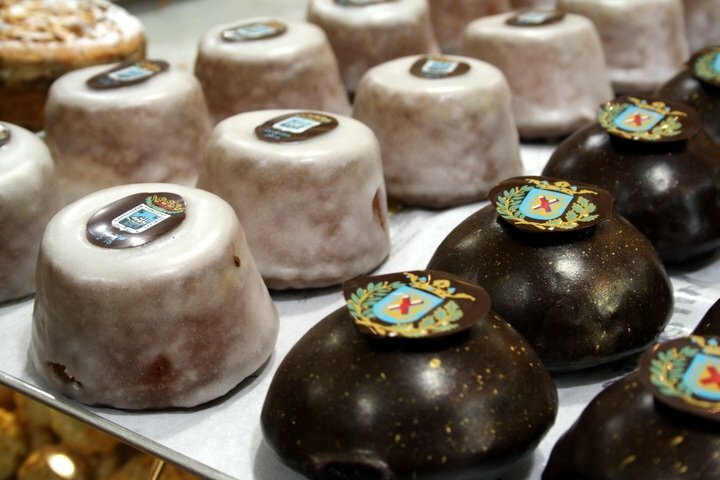 Read on to discover where to devour this delicacy (or take our San Sebastian food tour to try it for yourself!). Delicious cheesecake in San Sebastian! I fell in love with cider in Basque Country, having never tried anything quite like it before. Basque cider is quite different than the hard cider found in other countries. We call it “natural” cider here, and it is usually nothing more than fermented apples. No added ingredients, preservatives, bubbles or even sugar! The special pouring technique aerates the cider and gives it a bit of effervescence. Sidra – I LOVE this stuff! Another thing I learned to love (for better or for worse) in San Sebastian is foie gras. Whether in paté or freshly grilled, the locals love this decadent food. My favorite foie gras pintxos sear fresh foie until caramelized on the outside, and top it with a few flakes of sea salt. Often there’s a smear of jam or marmalade on top as well, as the acidity pairs perfectly with the rich foie. 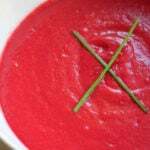 This is a food best served with zingy txakoli wine to clear the palate! 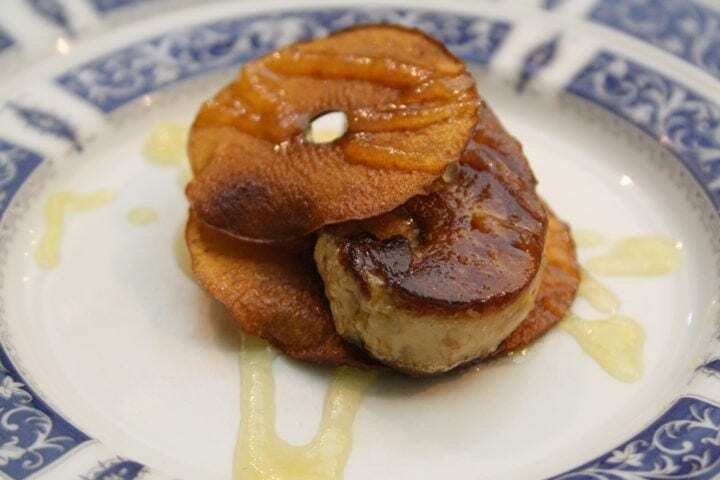 The foie gras pintxo at Bar Haizea. Speaking of txakoli, this is another must try in San Sebastian. This local white wine is served the same way as the cider, poured from a great height in order to create effervescence. It’s a delicious partner in crime to a pintxos crawl! 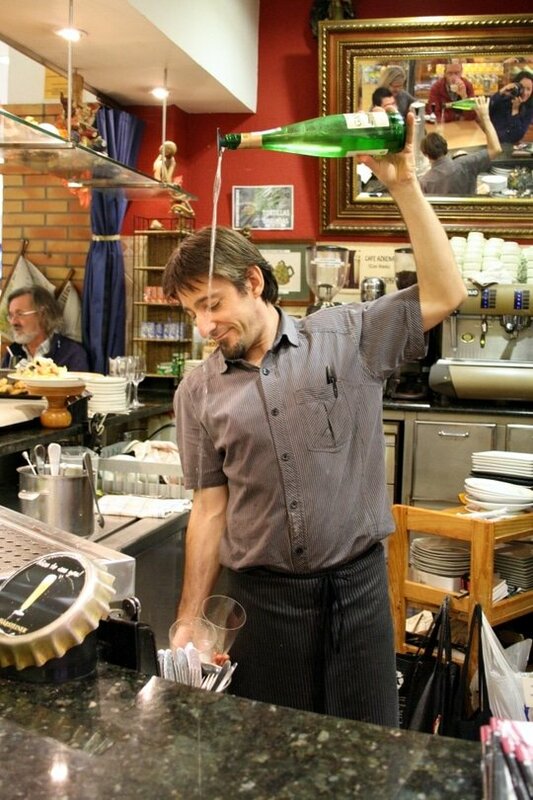 The waiter pours our txakoli wine in Bar Azkena in the La Bretxa Market. cod omelets (tortilla de bacalao—popular first course at the cider houses). The famous salt cod omelet at a cider house. 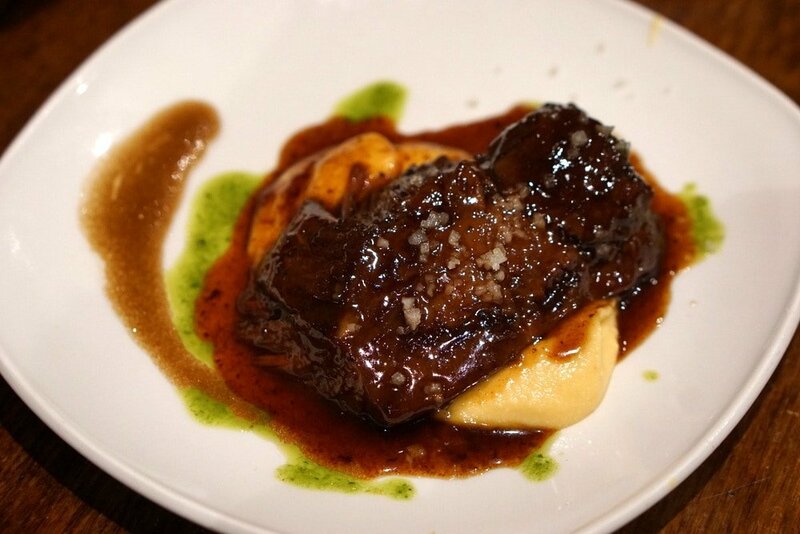 Once considered a poor man’s food, carrillada is slow-cooked beef or pork cheek. This dish is now one of the most popular guisos (stews) in all of Spain, and can be found at some of the best restaurants and pintxos bars in San Sebastian. Aged grass-fed beef is on a whole other level of meat obsession. 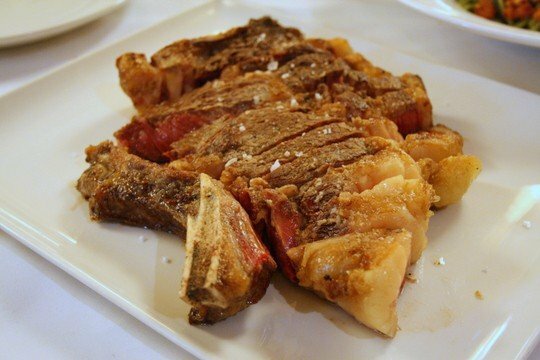 Steak may not be the first thing people think of when coming to Spain, but perhaps it should be. 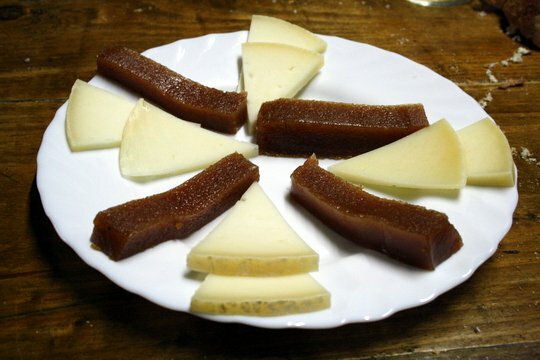 San Sebastian has plenty of restaurants that serve the famous local txuleta. This aged, grass-fed beef is served rare, and by the kilo. It’s one of my top thing to eat in San Sebastian. 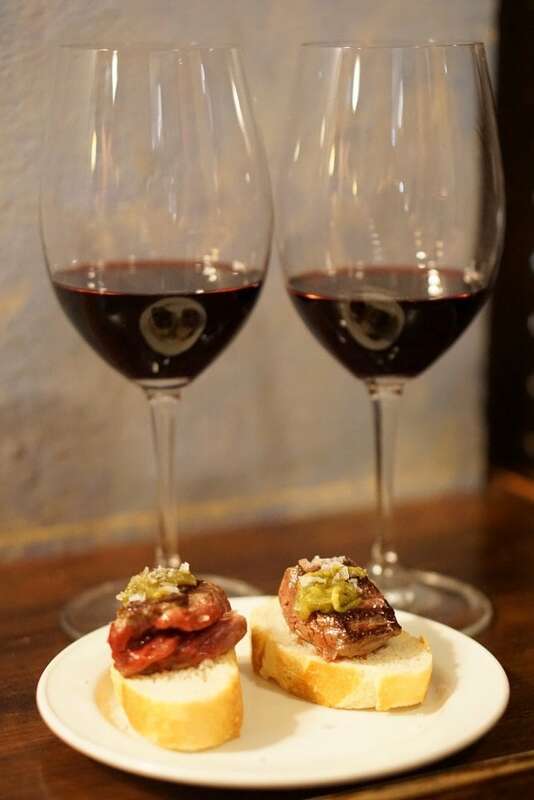 Try it: You’ll taste one of the best bites of local beef on our Ultimate Pintxos & Wine Tour in San Sebastian’s old town. 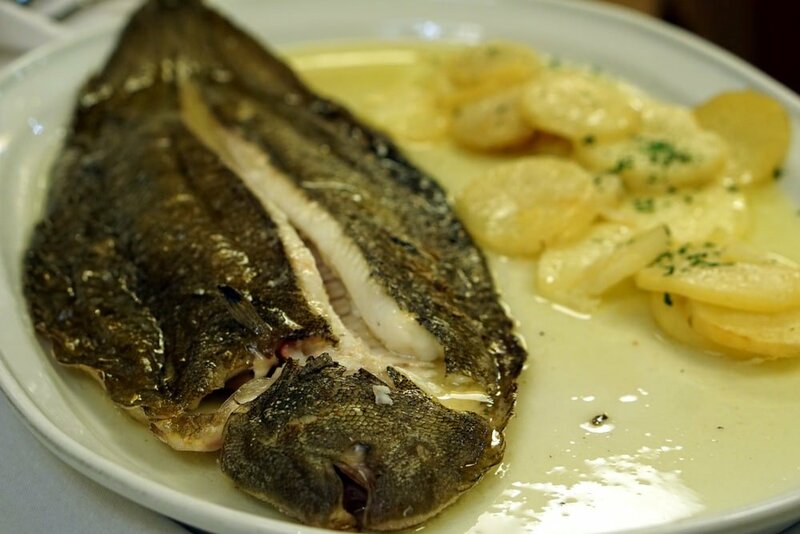 Fish cheeks (also translated as necks or glands) are a delicious Basque specialty. 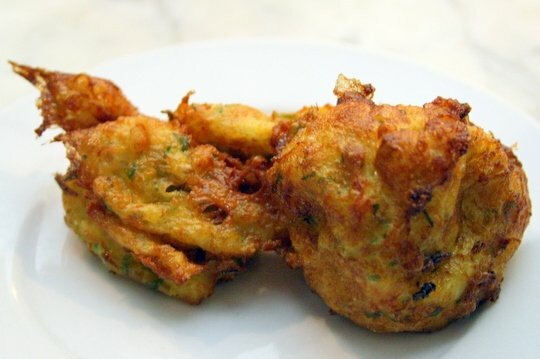 Usually coming from cod or hake, the flavor is unique and definitely something a true foodie shouldn’t miss. Do not miss a leisurely fish themed lunch while in San Sebastian, a local tradition. You’ll usually order a whole fish, generally intended for two or more people, along with other raciones (shared plates) from the menu. 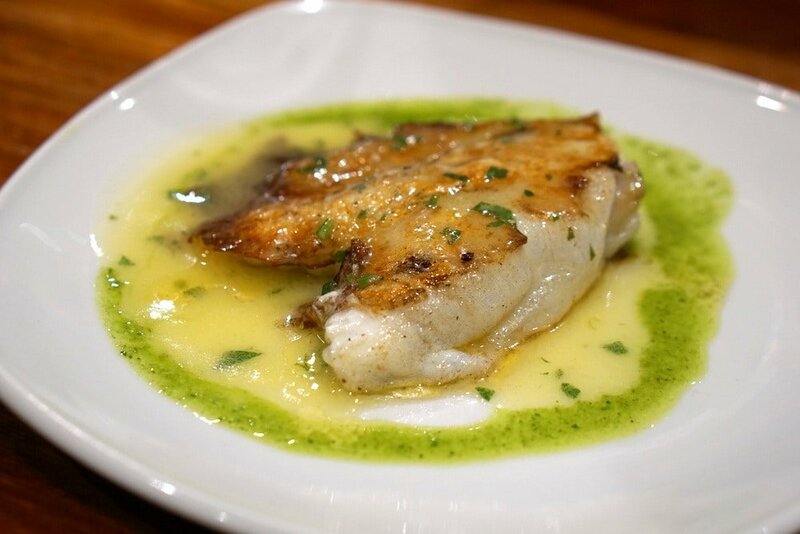 Some of the most delicious fish to order are merluza (hake), lenguado (sole) and rodaballo (turbot). Bright green Basque Country is home to plenty of sheep, goats and cows– and this means great cheese! Don’t miss my favorite, Idiazabal. This sheep’s milk cheese was once kept in the rooftops of local farmers’ huts, meaning it acquired a smokey flavor from the hearth. One of the most traditional desserts from the Basque Country, this “Basque Cake” is made with a soft shortbread crust and filled with either almond-flavored pastry cream or black cherry preserves. Go crazy and try both! One of my all-time favorite pintxo bars in the San Sebastian old town, Borda Berri is often crowded, but worth the wait. 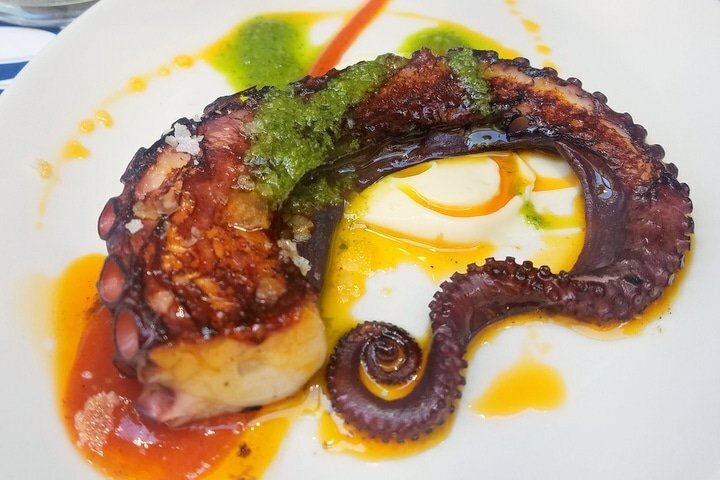 Try the octopus or the duck, but really anything on their menu is good. Don’t be surprised not to see pintxos lining the bar here, as all they serve is made to order! 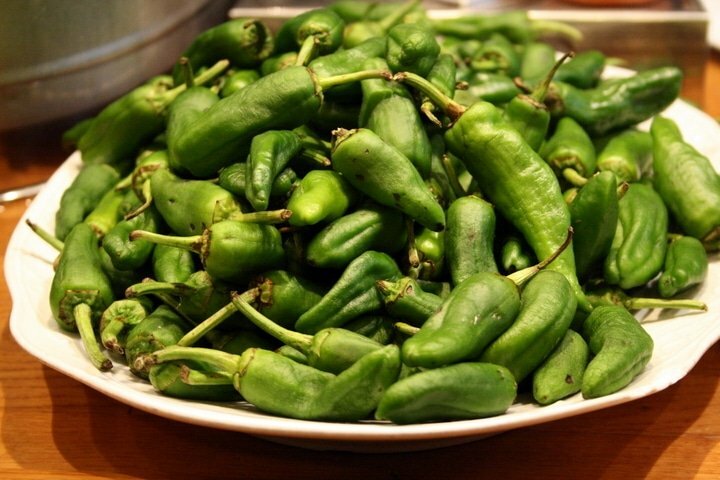 Known locally as “the holy trinity” because it cooks three things to absolute perfection: tomato salad, Padrón peppers, and txuleta. But those who are really in the know go very early because each day a handful of lucky people get to try the famous house tortilla de patatas. Only a couple are made daily, and they sell out in a flash! This delicious seasonal dessert also deserved a photo! I love Casa Urola for its classy but non-pretentious vibe. It’s not cheap (though it does also have a pintxos bar below), but won’t run you anywhere near Michelin Star prices. 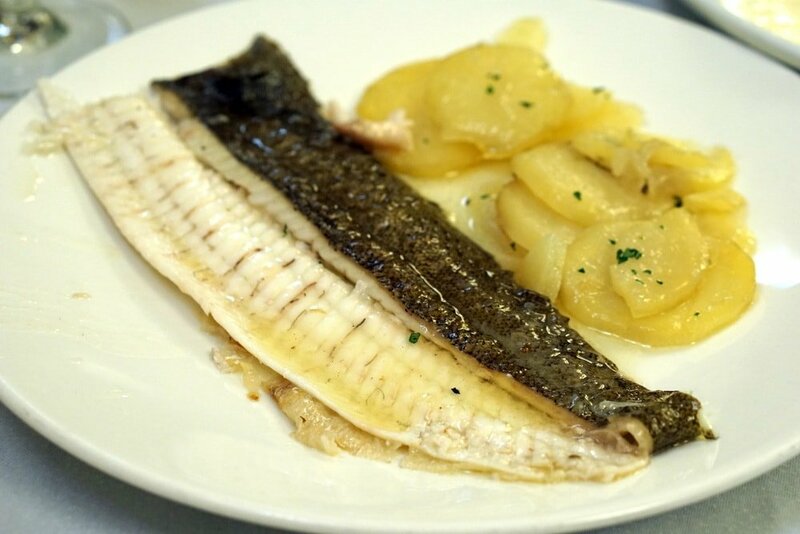 The traditional Basque menu consists of amazingly prepared fish, steak and sides. The wine list and desserts are also excellent. Bodegón Alejandro has long been known as one of San Sebastian’s best deals. 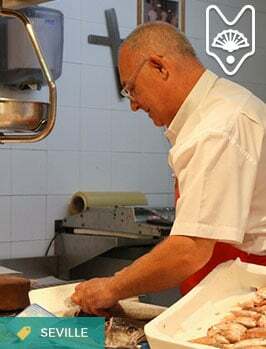 While not a Michelin Star restaurant, it is managed by the famous Martín Berasategui (his parents were the original owners, and this is where he learned to cook!) and it serves an unbeatable six-course lunch menu for under €50 (as of 2018). One of the city’s most famous pintxos bars, this is another place worth trying if you can squeeze your way in. Their cochinillo (suckling pig) pintxo is my personal favorites. Another of my favorite traditional Basque restaurants, I love Gandarias for its food, history and friendly staff. While it does have a great pintxo bar, I like its restaurant even better. Make sure to reserve! 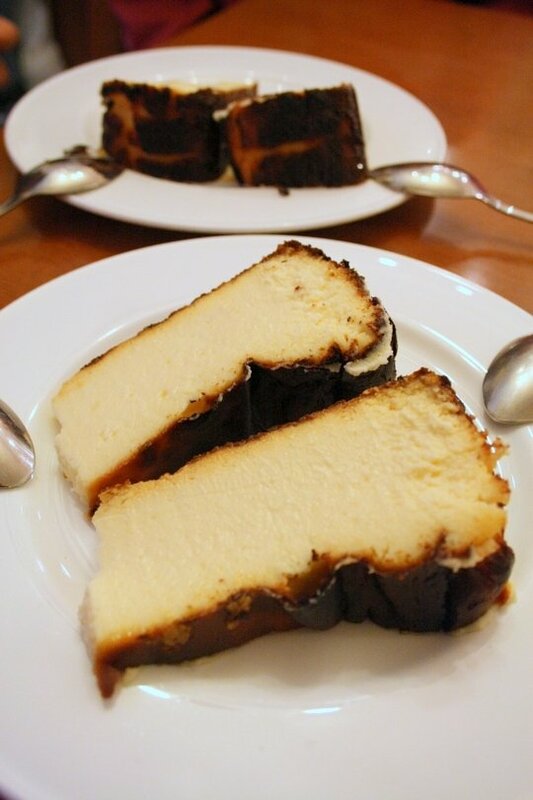 Remember my favorite cheesecake in the world? It’s here! Just go, you won’t regret it. Old school mussel bar in San Sebastian! This unique and delicious “mussel bar” is just that– a pintxos bar dedicated to serving mussels in different ways. Since I adore mussels, it’s naturally one of my favorite places in town. No frills for sure, but well worth it! Another great place for a steak is called (appropriately) txuleta. Definitely make a reservation if you want to score a table here, as it’s busy with locals and tourists alike! Salt cod fritters at Bar Haizea. I wrote all about my love for Haizea here, and it hasn’t changed. Classic pintxos, friendly service, and totally local. Does it get any better? San Sebastian is also home to some beautiful fresh markets, where you’ll see the local cuisine in its most simple state. Fresh fruits and veggies at the San Sebastian markets. This beautiful market is San Sebastian’s oldest, and well worth a visit. Built over the original breach, or bretxa, in the city walls from the historical battle of August 31st, 1813, Mercado la Bretxa has anything you can imagine needing! From gorgeous organic fruit and vegetables to fresh fish and local meat, this is a place where you might brush shoulders with a Basque grandma and then a Michelin Star chef. See more: Find our about San Sebastian’s other markets here! Pouring cider after the Txotx! Not quite a restaurant, a Basque Cider is more a workshop of sorts. When the year’ cider production is just about finished, the local cider houses need people to taste (and buy!) the lot. Since cider only lasts in the bottle for about a year, it’s very important that they sell it all. So why not open up the factory doors, cook some food, and invite people in? This line of thinking brought the cider house eateries to life! Here you’ll pay a price per person and the food just keeps coming. 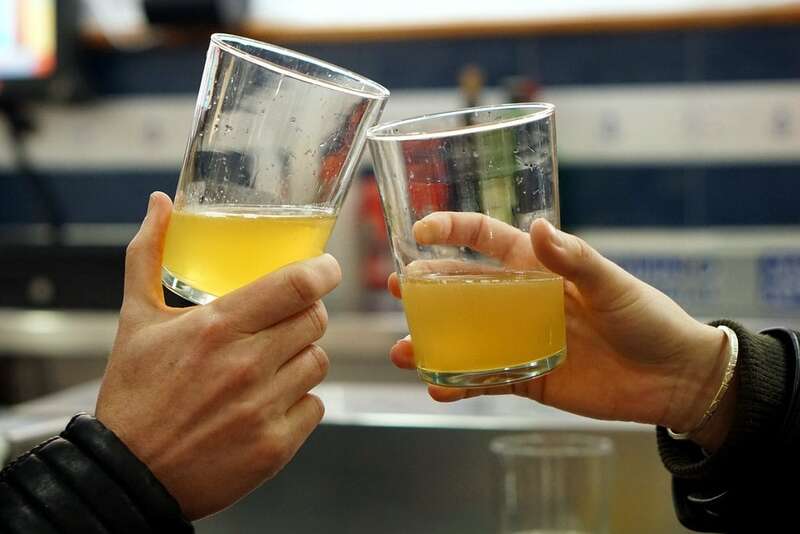 Read more: Learn all about Basque Cider houses in San Sebastian here! I’ve never had the chance to dine at one of San Sebastian’s Michelin starred restaurants, but I can only imagine it would be quite an experience! Many friends have eaten at Arzak and I haven’t ever heard a bad word. I recommend taking a look at the menu and prices before trying to get a reservation– and make sure to reserve far in advance and note any dietary restrictions at that time. Not ready to splurge on a Michelin star meal? Check into their lunch options– some do a limited fixed price lunch menu for a very reasonable cost. In restaurants, a bread and service charge may be added to the bill. This usually ranges between 1€ to 3€ per person, depending on the place. If you don’t want bread brought to the table, specify sin pan por favor, though unfortunately sometimes you’ll still be charged a cover fee. 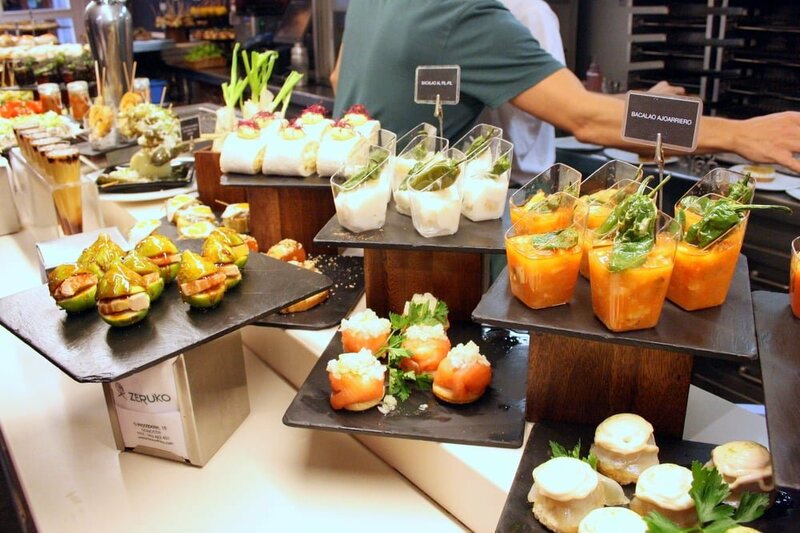 Pintxos bars are busy places — in order to get service you may need to be more assertive than you’re used to! Don’t expect to be asked if you want a second drink, more food, the cheque etc. Just ask! You aren’t required to tip in San Sebastian, but rounding up the bill and leaving up to 10% for excellent service is much appreciated (I always tip my servers). Waiters work hard and, on average, earn a very low monthly wage. At some traditional places, the menu won’t be available in English. Always order slowly and ask for help! If you are planning to visit San Sebastian I would love to have you join one of Devour’s San Sebastian Pintxos Tours. Our mission at Devour Tours is to help local culture thrive by connecting curious travelers with communities, cuisines, and traditions. We support small business on our tours, sharing their stories and place in the local community. Our tours are fun and engaging cultural experiences where you’ll try 10+ different foods at a variety of traditional, family-run places. 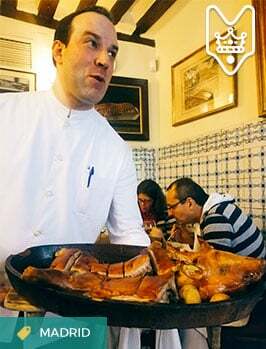 But we also go beyond the food, and between bites, you will learn plenty about San Sebastian’s unique culture, cuisine, history, and traditions. They really capture the soul and identity of San Sebastian, and are a lot of fun! You can reserve spots online here: book San Sebastian food tour. And if you have more tips for where to eat in San Sebastian (the best things to do in town! ), please leave them in the comments! And if you’ve already been– where (and what!) did you try? Pingback: Visiting Saint Jean de Luz from San Sebastian - An Insider's Spain Travel Blog & Spain Food Blog! Pingback: 6 Top Places for Pintxos in San Sebastian - An Insider's Spain Travel Blog & Spain Food Blog! Pingback: Lekeitio: Basque Country's Most Charming Town - An Insider's Spain Travel Blog & Spain Food Blog! Pingback: Bar Haizea: Our Intro to Pintxos in San Sebastian - An Insider's Spain Travel Blog & Spain Food Blog! Pingback: San Sebastian Walking Tour & Pintxo Crawl - An Insider's Spain Travel Blog & Spain Food Blog! Yes! I have watched a couple of cool documentaries about him. I would love to visit- have you been? We’re travelling to San Sebastián in April, where is best to stay? Old town? The old town or Gros would both be great. The old town may be a bit louder. Gros is only a 10-15 minute walk away. On my next visit, I have to go to one of the cider houses!